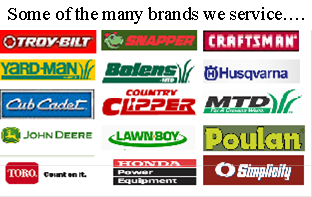 We provide honest, fair and high quality service and repair for most lawn mower brands and outdoor power equipment. We pride ourselves in providing outstanding service and building one-on-one relationships with our customers. We are authorized to perform warranty repairs for several manufacturers including Briggs & Stratton, Honda, MTD, Troybilt, Murry, Kohler, Husqvarna, Stihl, and others. When you need it fixed right at a fair price you can count on us to deliver. Our factory trained techicians have the knowledge and experience to perform even the most complex repairs. All equipment performs better when properly serviced and we have several service packages to keep your equipment in tip top shape. Most lawn mowers can be maintained with the EZ Mower Care Service program. If you need your snow blower, tiller, generator, or power washer serviced we have modified programs to meet those needs as well.